It's been cold recently, so more comfort food required, plus the fact that I hadn't made stew in years. Used 900g of lean casserole beef (seasoned in flour, black pepper, salt and cayenne pepper), lots of baby chantenay carrots, a couple onions, a load of shallots, a few ribs of celery, and pint or so of stock and a bottle of Guinness. Left to cook for 3 hours with some thyme and bay leaves, then just served as it was, but with a little bread to wipe up the gravy. The amount I cooked would probably suite about 5 or 6 people (depending on the people). Might have been nice to have some dumplings too, but not really necessary with all the potato and carrot. Thing is, there were only 2 of us, but I'm sure it will taste even better the next day, although I've already got a trade arranged for some lasagne which was made elsewhere tonight (although by the sounds of it, I'll be fishing the mushrooms out, so not the best trade I've done). If I were making it again, I doubt there is much I would do differently. Except perhaps use a bit of bacon as well, as one recipe suggested. 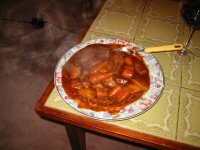 I would probably take the photo with the stew in a nicer plate or bowl, and slightly better presented. But other than that, it was pretty good as it was. It's what it tastes like that really matters, not whether someone has sloshed the gravy around on the way from serving to table. Still working on the requirements of the site, and investigating various 3rd party APIs which may also be needed.